Minutes before clouds gathered over the night sky, astrophotographer Matt Pollock took this image of the Milky Way on March 3, 2016 from Cherry Plain State Park in Petersburg, New York. Minutes before clouds gathered over the night sky, astrophotographer Matt Pollock caught this snapshot of the Milky Way. Pollock took the image on March 3, 2016 from Cherry Plain State Park in Petersburg, New York. 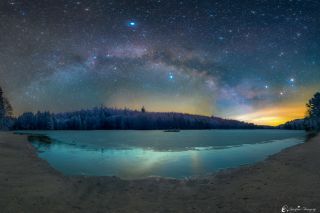 "Despite gathering clouds and the rapid approach of dawn, I managed to hike in, set up my tripod and align my Astro Track to the north star and get the 3 shots spaced 60 degrees apart necessary to capture the full arch of our home galaxy with its core peeking out through the haze, clouds and incoming fog," Pollock wrote in an email to Space.com. Pollock used a Nikon D800 with modded Baader filter, Niikon 16-35mm lens @ 16mm and a double fog filter. The night sky objects were tracked for 200 seconds at F4, ISO 800 and the foreground was taken during civil dawn at F6.3, 1/6th of a second at ISO 160. Editor's note: If you have an amazing night sky photo you'd like to share with Space.com and our news partners for a possible story or image gallery, please contact managing editor Tariq Malik at spacephotos@space.com.